Saturday saw me rising early, picking up a bunch of pupils and heading out to Drumnadrochit on the banks of Loch Ness to take part in the 3G (Three Glens) mountain biking race. Whereas super-sporty D was cycling the full 56 miles from Glen Affric (above) to Fort Augustus, we were more realistically starting half way down the route. Ahead of us lay 26 miles of forest tracks, steep climbs, juddering downhills and muddy puddles. The kids were hugely excited. So much so that on the starting whistle one toppled over onto another and both boys ended up in a tangled heap of chains and limbs and wheels and shorts as the other riders vanished over the hill. I thought this was hillarious. They didn’t and glowered at me furiously. An opportunity for the two to have a giggle at me came later that day as I took a full hour longer than them all to complete the course! Did I enjoy it? Difficult to say. During the actual race I was cursing myself for ever agreeing to take part. At one point I remember mentally making a list of all the things I would rather be doing at that moment. When I tell you that “going to the dentist” was on the list you might understand how much I was not enjoying myself. And yet, half an hour after crossing the finish line; twenty five minutes after telling D that I had hated every minute was never biking again; twenty minutes after getting my breath back, I suddenly started feeling rather proud of myself. Two days later I’m seriously considering taking part again next year! Sunday was a far more relaxed affair. A friend, her daughters and puppy (Teal) came to visit. We played in the park, read about Jamie’s stripey pet snake and ate apple muffins. Muffins which were such a hit the girls asked to take some home with them and now I’m left with none! Think another batch will have to be knocked up very, very soon. I omitted the rosemary her recipe called for as some kids have an aversion to “green bits”. Added extra cinnamon instead. There was nothing so virtuous as buttermilk in my fridge so I used mixture of milk and Greek yogurt. Cleaning the blender is my most hated job (one of, anyway). I combined by hand! I cannot believe it 26 miles! I understand why you thought going to the dentist would have been better. But you are just amazing for completing this race with such a high spirit. Way to go Wendy. Your muffins look spectacular, better than mine! You make me want to make another batch too, this time the way you did it. I am so happy you and your girlfriends enjoyed them. Amazing Wendy! I don’t know if I can do what you did!!! And the muffins look really good. Well, that photo sums it up for me. Worth it? Oh, yes Wendy! Good on you. Lat time I rode anywhere my bum hurt for days…hope you’re okay. Right. I’m convinced. I’ll give these a go. I’m really impressed, both with your biking and the beautiful muffins! I feel so lazy all of a sudden. Well done on the bike riding Wendy!!!!! There is no way I could do that!!! You have every right to be proud of completing the journey!!!! And those muffins look really yummy!!!! Nora – Funny you made the same changes as me! They really are more-ish, aren’t they? Rose – 🙂 Have to admit I wasn’t all that high-spirited during the ride! Anh – Thank you! Once I was half way there was no option but to finish the race! 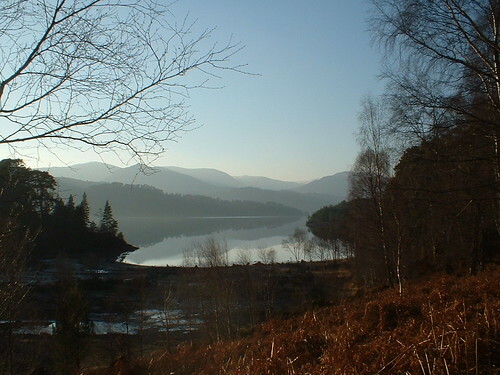 Lucy – Must admit I took that photo at Glen Affric last year, not at the weekend. Couldn’t even think of photography! Pat – Thank you so much! It’s a relief to know that others think 26 miles is a long way too! 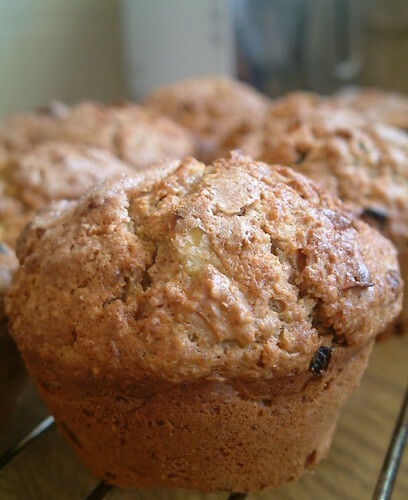 Mmmm, apple muffins – they look yummy! I can never find buttermilk, either so always use yogurt and milk mixed. I actually like the results better! Congrats on the bike rice! I’ve had those thoughts myself when I’ve been involved in something I SHOULD do/like, but would rather not…. I cannot get past that first photo! Oh Wendy it is beautiful! I long for the mountains! A big pat on the back for you girl!!! Congrats for finishing the race! 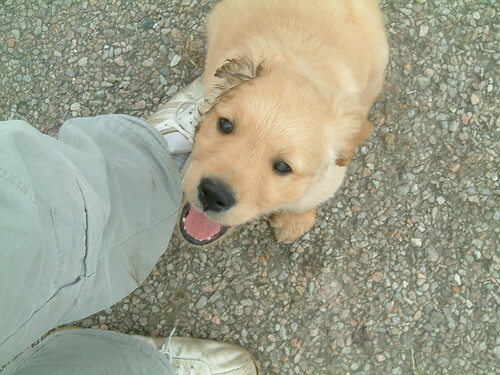 And OH, that puppy! I know the day will soon come when we will see a photo of a puppy on your site and the caption will be “new addition to our little family”! Your muffins look just as yummy as Rose’s! I can smell that extra cinnamon now! Deb – It’s a stunning location. I’m looking forward to that day too! !